With October half term in full swing (as much as five days away can gather any kind of swinging pace), our thoughts turn to those of you with pets or taking pet friendly holidays during firework season. Long gone are the days when fireworks were reserved for Guy Fawkes celebrations. As soon as the clocks change, the bang, swoosh, crackle of autumn nights begins. Actually, the law dictates that shops can only sell fireworks during two defined periods (15 October to 10 November and 26-31 December) unless they apply for and are awarded a licence to sell fireworks outside of those restricted periods. Still, this is pretty cool stuff for kids with autumn birthdays – what better excuse to gather friends and hand out the sparklers while appointed safe parent handles the serious sky demonstrations at the other end of the garden. Chuck in some toffee apples and toasted marshmallows and you’ve got a party to remember. But what about your resident Fido or Felix? According to the RSPCA, some 45 per cent of dogs are scared of fireworks, but surely they freak out cats, rabbits and guinea pigs too. We trust that the goldfish probably won’t notice. If you’re attempting a pet friendly holiday this autumn, or even an October half term break with the dog in tow, you’re more than likely to experience a firework display that might unnerve your pet entourage. Bearing in mind you’re also in an unusual environment, we’ve got some tips to help pooch cope with the noisy antics. We won’t go as far to suggest counselling for your pets (though we understand that such a thing does exist for anxious animals), but see how you get on with these ideas. Obviously, always keep cats and dogs inside when there are fireworks going off. And what better way to get to you know your holiday home inside and out than to find a nook for pooch to park themselves in when the big bang action kicks off. Can they tuck themselves in under the stairs or is there an under stairs cupboard they could make home, but which the door could be wedged open on (let’s avoid any Harry Potter scenarios shall we). Alternatively, depending on whether you’ve got a Tibetan Terrier or an Alaskan Malamute, there might be an armchair they could cosy under, or perhaps just wedge themselves under the kitchen table. Unless you know your dog is completely fine with the echoing bangs of fireworks, it’s best to stay home with them (presuming you know that there’s going to be a fireworks display on nearby). Limit their exposure to the flashing and dampen the crashing by hunkering down for the evening and closing any curtains or blinds. Obviously, if you want to enjoy the view just close them in the room where doggy is happiest to hang out. Some dogs will just want to be left alone, quietly, until the rockets have finished. For those content enough to interact, it’s a pretty good time to proactively play with them and their favourite toy. And for those seeking comfort of the foodie type, find the biggest rawhide you can! Sounds simple when you say it but… stick to walking your dog during daylight hours at this time of year. Leaving your smaller pets at home while your away? If you’re leaving your hamster, gerbil or rabbit at home to be fed and watered by friends or neighbours, it’s worth preparing your pet’s guardian for the firework eventuality too. There are a number of approaches depending on the size of your pet’s hutch and whereabouts it is. Whether they live inside or out, block out light by throwing over a blanket or sheet. This will also dampen the banging a little too. For outdoor animals in hutches that are easily moveable, you might want to consider putting them in the garage for the duration of any activity. And so it’s time to enjoy events. 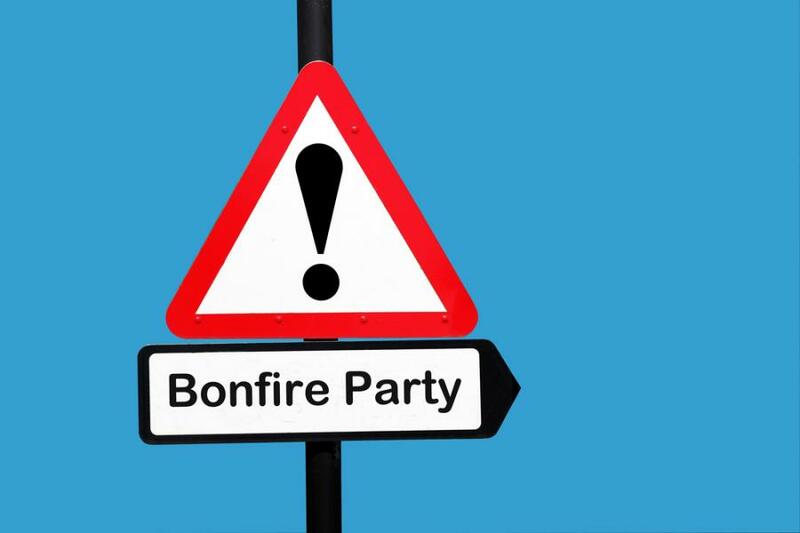 Most towns and villages have a bonfire and firework display. So wherever you choose to holiday in Britain this autumn, you won’t be far from an evening’s cheap, or free, entertainment. It’s probably the last time you’ll have a sausage off a barbecue in 2015 and possibly the only time you’ll have a toffee apple. Have a great autumn break and we hope your whole family enjoys, rather than endures, the fireworks.